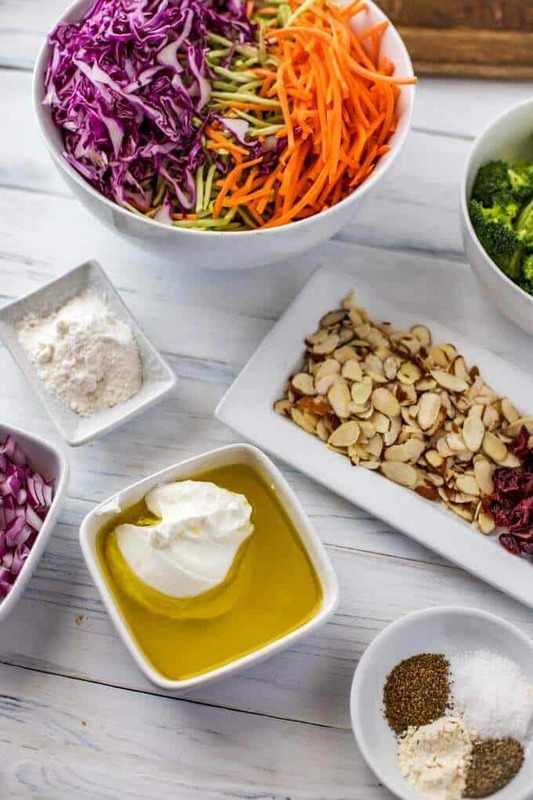 If you are looking for a healthy side for your next gathering, this Broccoli Slaw Salad is a fabulous option. It is packed with both flavor and nutrition and is a crowd pleaser. With a no mayo dressing, this is a dish you can feel good about serving. Naturally gluten-free and easily made vegan. Leftovers are great on sandwiches and wraps. 2 How Do I Make Broccoli Salad? For as long as I can remember, broccoli has been one of my favorite vegetables. I am sure it started with my Mom, who would do anything to get us to eat our veggies. And my Mom has always had my number. Anyone who knows me knows that I love, love cheese. From the time I was tiny, the only way I remember my Mom serving broccoli was with gobs of melted cheese on top. I was always so caught up in the cheesy goodness of it all that I never thought to resist the green. I can even remember begging to eat JUST BROCCOLI FOR DINNER. I am certainly not going to dis the classic broccoli and cheese combination, however these days one of my favorite ways to eat broccoli is raw. The crunch-factor can’t be beat, and I love how a delicious broccoli salad makes me feel. I have mentioned before that I struggle with grocery waste and so this is something I have been working diligently on. A few weeks ago when I found myself with a lot of broccoli on hand, I started thinking about using some of it in a salad. And while I was at it, why not use the stalks too! 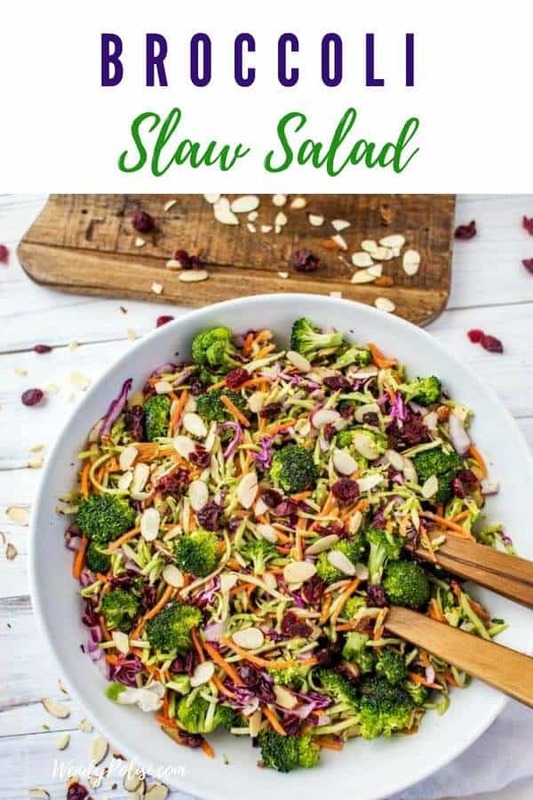 This Broccoli Slaw Salad recipe is a fabulous way to use ALL the broccoli, however if you are short on time you can just as easily pick up a bag of broccoli slaw at the grocery store. How Do I Make Broccoli Salad? In just 15 minutes, you can be enjoying a delicious Broccoli Slaw Salad! First, you want to get all of your ingredients together. 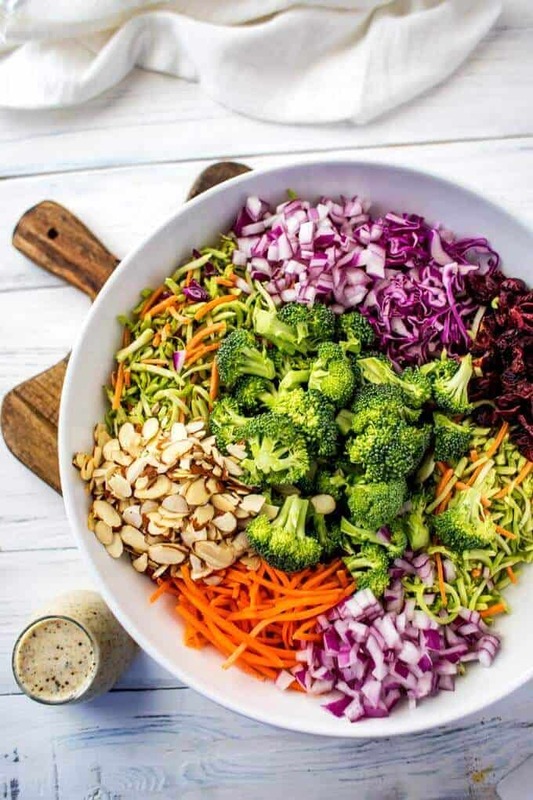 You will need broccoli, broccoli slaw, carrots, cabbage, red onion, almonds, cranberries, Greek yogurt, olive oil, lemon juice, Swerve, garlic powder, celery seed, cayenne pepper, salt, and pepper. 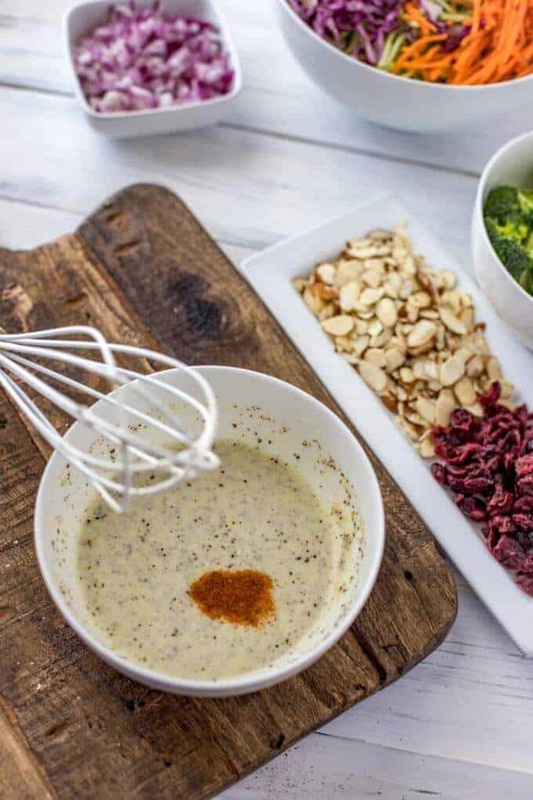 Next, combine yogurt, olive oil, lemon juice, Swerve, Garlic powder, celery seed cayenne pepper and salt and pepper in a blender or small bowl. Mix well. May be made ahead or tossed immediately. Finally, in a large bowl combine slaw, florets, almonds, cranberries and red onion. Toss with salad. This salad will keep in the refrigerator for up to two days. How long will this recipe keep in the fridge? I prefer this dish the same day it is made because the texture is best then, but you can keep it in the fridge for up to three days. I prefer leftovers after the first 24 hours in wraps or on sandwiches. Can I Use Mayo in this Dressing Rather Than Greek Yogurt? What Sweeteners Work Other than Swerve? Make it Vegan: Use plain non-dairy yogurt. Alternatively, Vegan Mayo (Veganaise) is amazing in this dressing. Make it Nut Free: Omit the almonds and instead use sunflower seeds or pepitas. For a fun twist, use a Honey Dijon Dressing in place of the one here. This one from Detoxinista is a good one to try! In the fall, I like to add in a chopped Fuji apple. You can do this in addition to or in place of the cranberries. This salad may be made ahead and stored in the fridge for up to two days. If you have Broccoli in the fridge, use the stalks to make your own Broccoli Slaw. You can grate them with a hand grater, but a food processor makes quick work of this. I like to add in shredded purple cabbage and carrots. This salad is a great side for your next grill out! Serve it with grilled chicken, burgers, or steak. It is also great in wraps! 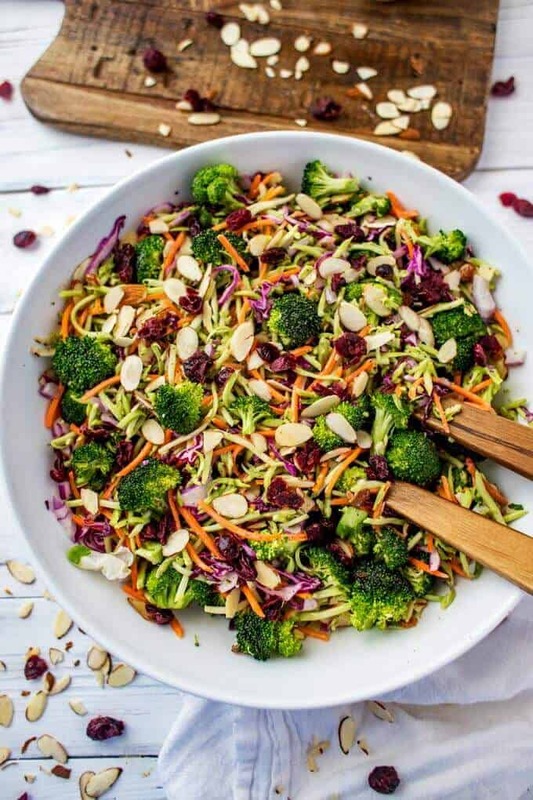 This Broccoli Slaw Salad is a great healthy side for your next grill out! Naturally gluten-free and easily made vegan, this salad is a crowd pleaser. It is also fabulous on sandwiches and in wraps. In a small bowl, whisk together Greek yogurt, olive oil, lemon juice, Swerve, garlic powder and celery seed. If you like a little heat, add in cayenne pepper. 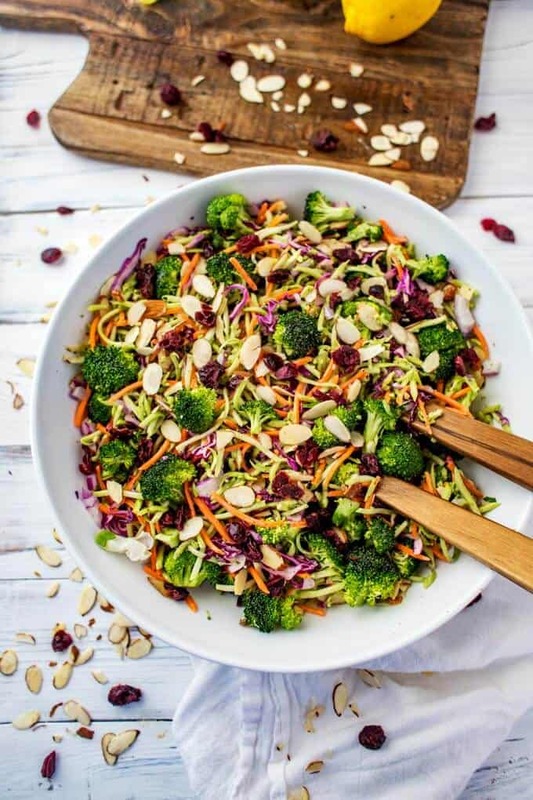 In a large bowl, add broccoli slaw, broccoli, almonds, cranberries and red onion. Toss salad with dressing. Refrigerate until serving. 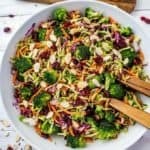 I love broccoli and your Broccoli Slaw Salad looks really yummy.I can’t wait to give it a try. This is the perfect picnic dish! I really love salads with broccoli. This looks great! Fresh ingredients go the distance with this salad. I would really love to dig into this! I am a huge fan of slaw recipes. This looks so tasty! I love broccoli! It would be perfect in a salad! i need to bookmark this recipe! This salad looks really yummy. It will work great for my next grill out. Great recipe..